Animal lover though she was, Lorin Lindner was definitely not looking for a pet. Then came Sammy – a mischievous and extremely loud bright pink Moluccan cockatoo who had been abandoned. It was love at first sight. But Sammy needed a companion. Enter Mango, lover of humans ("Hewwo"), inveterate thief of precious objects. Realizing that there were many parrots in need of new homes, Dr. Lindner eventually founded a sanctuary for them. Meanwhile, she began to meet homeless veterans on the streets of Los Angeles. Before long she was a full time advocate for these former service members, who were often suffering from Post-Traumatic Stress Disorder (PTSD). Ultimately, Dr. Lindner created a program for them, too. Eventually the two parts of her life came together when she founded Serenity Park, a unique sanctuary on the grounds of the Greater Los Angeles Veterans Administration Healthcare Center. She had noticed that the veterans she treated as a clinical psychologist and the parrots she had taken in as a rescuer quickly formed bonds. Men and women who had been silent in therapy would share their stories and their feelings more easily with animals. 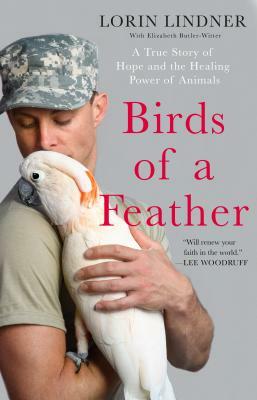 Birds of a Feather is ultimately a love story between veterans and the birds they nurse back to health and between Dr. Lindner and her husband, a veteran with PTSD, who healed at Serenity Park. Full of remarkable people and colorful birds, this book reminds us that we all have the power to make a difference. Dr. Lorin Lindner is the Clinical Psychologist for Clinica Sierra Vista Behavioral Health. She initiated the use of animals to treat trauma in Veterans at the VA Hospital in Los Angeles—the first program of its kind. She is the President of the Board of the Association for Parrot C.A.R.E. and of the Lockwood Animal Rescue Center. She and her husband live in the mountains above Los Angeles with numerous rescued wolfdogs, wolves, coyotes, foxes, horses, dogs and of course parrots.